Even though I’m quite experienced with baking large number of items for bake sales, her request had me stumped. First off, for an inexperienced home baker, producing 150 pieces is not a trivial task unless she wants to spend hours upon hours in the kitchen (I assumed not). That pretty much ruled out individual cookies because an oven can only realistically churn out 16-20 at a time for portion size that makes sense for bake sales. My thoughts turned to bar cookies. With their streamlined method, each 9x13 pan can produce about 24 pieces and it’s not hard to imagine baking two to four pans at the same time. Brownies are classic bar cookies but chocolate is expensive. 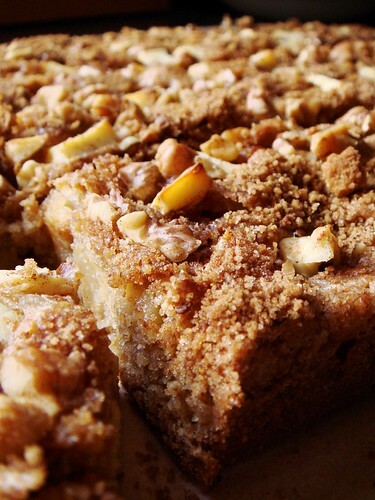 Blondies, on the other hand, are the poor man’s version that are just as crowd-pleasing with their butterscotch flavour. Most blondies recipes get bulked up from add-ins such as chocolate chips or nuts. Nowadays, school needs to remain a nut-free zone so I needed to find a recipe that gets its flavour elsewhere. 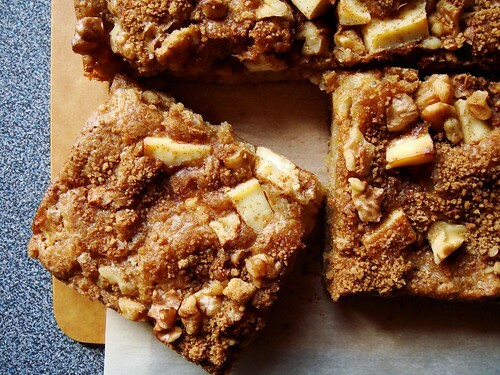 When I came across RecipeGirl’s Apple Harvest Blondies, I knew I hit jackpot. 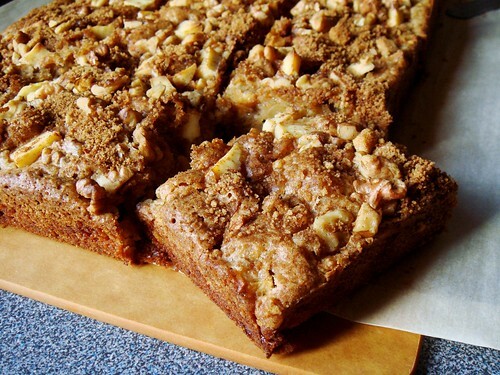 These blondies get a sweet tart taste from apple dices but the surprise lies in the chopped up bits of cream cheese in the topping. Although it calls for nuts to top the pan, it is quite optional and can be easily substituted with rolled oats for that same crunch factor. The batter uses melted butter for a chewy texture. No mixers required! Before I could recommend this recipe wholeheartedly, I must test it out first. In my version, I used half rye flour and half all-purpose flour because I recalled how much I enjoyed the creamy taste of rye against sweet tart apples in a previous recipe. I played up the warm spicy taste by adding 1/2 teaspoon each of cinnamon and ground ginger to the batter in addition to a big pinch of salt. As you see in the photos, I opted for walnuts rather than oats. My batch came out very moist and tender (good keeper) that made me think of snack cakes rather than bar cookies. It was really tasty that I would include in my own baking repertoire as well. At first glance, limitations and constraints may appear to stifle creativity. However, I know better by now that they are often the motivation that broadens my horizon. Do you have recipes that you wouldn’t look into otherwise?